"The best way to predict the future is to invent it." Alan Kay, U.S. computer scientist We are on the threshold of a new era. Our planet's climate is at risk. Natural resources are growing scarce. In 2050, the number of people living in cities will be greater than the entire population of the Earth today. That's why researchers, inventors, and engineers need to be more creative today than ever before. Computers as medical assistants, robots as household servants, sensory organs for electric cars, buildings as energy providers, farms in skyscrapers, power plants in the desert and on the high seas, supercomputers the size of a pea - these are not visions but almost tangible realities in laboratories all over the globe. In a unique survey, science journalist and industry insider Ulrich Eberl vividly describes the key trends that will shape our lives - and how we ourselves can help to invent the world of tomorrow. ULRICH EBERL (born in Regensburg in 1962) is one of the most renowned science and technology journalists in Germany. He studied physics and received his doctorate from the Technical University Munich for an interdisciplinary thesis on the first trillionths of a second of photosynthesis. Starting in 1988, he worked as a freelance journalist for various newspapers and magazines, writing hundreds of articles on topics ranging from evolution and nanotechnology to space research and the excavation of ancient Troy. After working for Daimler's technology publications from 1992 to 1995, Dr. Eberl joined Siemens in 1996 as the director of its worldwide innovation communications. His particular interest is in futurology, and since 2001 he has been the Editor in Chief and publisher of Pictures of the Future (www.siemens.com/pof), a magazine for research and innovation that has already won several international awards in Europe and the U.S.. In a survey of 900 science journalists that was conducted in 2009, Ulrich Eberl was voted the best media spokesperson for corporate research in Germany, Austria, and Switzerland. In 2007, he acted as co-publisher of the book "Innovative Minds" which tells the story of 30 innovators and reveals how innovations take shape in a global company. 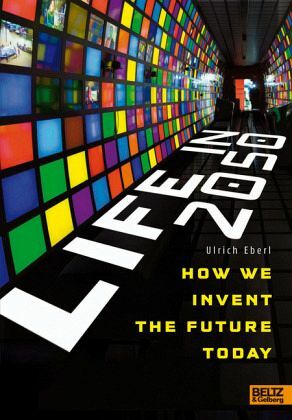 His new book "Life in 2050" - published in 2011 - vividly describes the key trends that will influence our life in the future and how we ourselves can help to invent the world of tomorrow. Ulrich Eberl (*1962 in Regensburg) ist einer der renommiertesten Wissenschafts- und Technikautoren Deutschlands. Er studierte Physik und promovierte 1992 an der Technischen Universität München in einem Grenzgebiet zwischen Physik, Biologie und Chemie: der Erforschung der ersten Billionstelsekunden der Fotosynthese. Seit 1988 schrieb er als freier Journalist Hunderte von Artikeln über Themen von der Evolution über die Nanotechnik bis zur Weltraumforschung und zu den Ausgrabungen in Troja. Von 1992 bis 1995 arbeitete er für die Technologiepublikationen von Daimler, seit 1996 bei Siemens als Leiter der weltweiten Innovationskommunikation. Sein besonderes Interesse gilt der Zukunftsforschung - seit 2001 ist er Chefredakteur und Herausgeber von Pictures of the Future (www.siemens.de/pof), einer Zeitschrift für Forschung und Innovation, die bereits mehrere internationale Preise gewonnen hat. 2007 war er Mit-Herausgeber des Buches "Innovatoren und Innovationen", in dem anhand von 30 Porträts geschildert wird, wie Innovatoren ticken und wie Innovationen tatsächlich entstehen. 2009 wurde Ulrich Eberl in einer Umfrage unter 900 Wissenschaftsjournalisten in Deutschland, Österreich und der Schweiz als bester Forschungspressesprecher für Unternehmen ausgezeichnet. In "Zukunft 2050" beschreibt Ulrich Eberl für junge Leser die wesentlichen Trends, die unser Leben in den nächsten 40 Jahren prägen werden und wie wir selbst die Welt von morgen miterfinden können.